When I was a kid, my mom made tacos using the hard, upright shell from the box. She fried up ground beef seasoned with the little packet of spice, also from the box. Then she sprinkled on some shredded ¨Mexican¨ cheese from a bag, directly on the meat so it would melt a little, and topped them off with some lettuce, onions, and tomatoes. Mmm, delicious. But wait—it turns out those aren’t authentic tacos as they are made in Mexico! Like California rolls in Japan or butter chicken in India, once off the tourist track you won’t find Ortega-style hard-shell tacos here in Mexico. And that’s a good thing. Real tacos are a palm-sized corn tortilla with meat, salsa, lime, cilantro, and onion. You can get them with cheese. They often come in orders of five. I have never seen hard-shelled tacos in Mexico. Many kinds of meat can be put into a taco, but one of the most common and cheapest is called pastor—big filets of pork cooked all day on a vertical spit, like shwarma, covered with spices and with a pineapple on top. Pork tacos, called pastor, are available everywhere and often offer the best tastes. Mexicans have a system for garnishing the taco—first squeeze the lime on top, and then put on the sauce. Every taqueria (taco restaurant) has at least two sauces, red and green. Taste them carefully because they can be extremely spicy. Better places have more sauces in yellow or orange, or chopped tomato, onion, and chili, or even peanut and other exotic sauces. Besides tacos, taquerias also serve taco variations like gringas, made with flour tortillas and cheese. The meat can be anything, but is usually pastor. Also, look for tacos arabes, Arabic tacos, which contain a seasoned meat with a thin pita-like tortilla. Authentic Mexican tacos are available everywhere. But tacos and gringas are only the beginning. 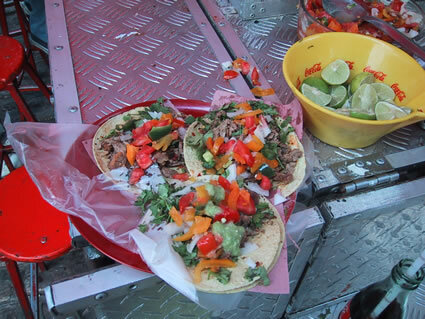 Tacos, while eaten for lunch or dinner, in restaurants or on the street, aren’t considered everyday eating. Coming to Mexico and only eating tacos is like going to New York City and only eating hot dogs. Antojitos translates literally as little cravings. These are small, often tortilla-based food served in restaurants, on the street, or at traditional family parties. You choose the meat or something vegetarian, and they are usually covered in shredded lettuce, green salsa, powdered cheese, and cream. Many people have heard of tostadas, hard fried tortillas often topped with chicken. A variant on a tostada is a sope, which uses a soft-fried, half-inch thick tortilla instead. Pambasos are deep fried sandwiches filled with the same great ingredients as tostadas. The bread is coated with tomato paste, so they fry up hard and red. Quesadillas also fall under the category of antojitos. They can be cooked with a wide variety of fillings, including meat or many vegetables, like mushrooms, zucchini flower (flor de calabaza), or huitlacoche, a surprisingly good fungus similar to blue cheese. Don’t take for granted the queso (cheese) in the quesadilla—often you have to order it explicitly. Huaraches (a pre-Hispanic word for flip-flops) are long flat oval tortillas with meat, beans, powdery cheese, salsa, and lettuce. The thick tortilla base is often stuffed with beans. Aside from meat, anything can go on top, such as eggs or nopales, cooked cactus leaves. Gorditas are thick, small, hard-fried tortillas stuffed with meat and drenched in hot salsa. As with a lot of Mexican food, the best place to eat gorditas is in a market. Antojitos can usually be found in traditional Mexican restaurants, many of which may only be open late at night. They are also commonly found on the street, but try to follow a local’s advice on where to eat so you know it will be clean. But still, like tacos, antojitos aren’t really thought of as a regular, everyday meal. Antojitos are available everywhere and not considered meals so much as snacks. 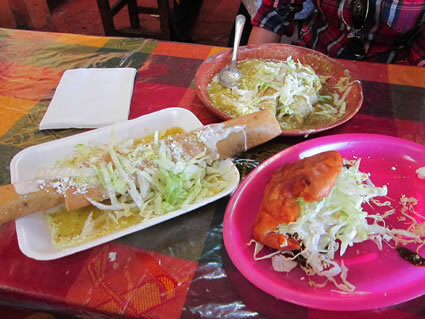 A staple of Mexican food is comida, which translates as either food or lunch. Mexicans typically eat their second meal of the day between 2 and 4 p.m. Though the meal is earlier, like dinner north of the border, comida is the largest meal of the day, with several courses, soup, meat, beans, and tortillas. In fact, unless Mexicans go out for tacos, the last meal of the day, eaten late around 8 or 9 p.m., may just be a glass of chocolate milk and a piece of bread. Restaurants that serve a full Mexican comida are called fondas, or fonditas. They have set menus that include a choice of soup (often vegetable or noodles), rice, beans, tortillas, and then the meal of the day, which could be a piece of meat in sauce, a stuffed pepper, enchiladas, or many other dishes. 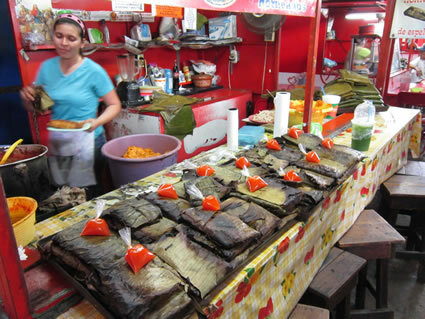 They include unlimited agua, a watered-down juice made with fresh fruit like strawberry, lime, melon, or tamarindo. The pitcher will be left on your table. 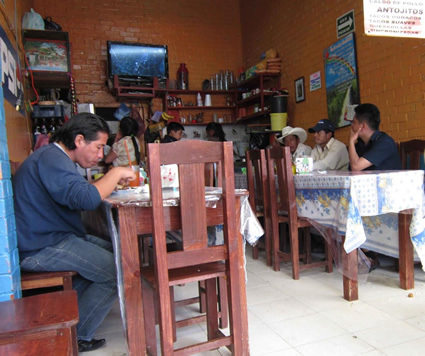 A meal at a fondita typically costs between 20-50 pesos ($1.50 – 4 USD). 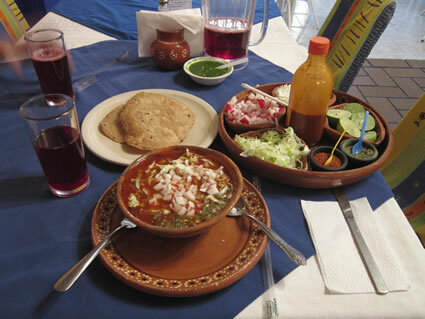 A full Mexican comida (meal) can be ordered at a fondita (restaurant) in the middle of the day, and it is usually a set menu. Pozole is a red soup with chicken, corn, lettuce, radishes, onion, avocado, and many spices. Perhaps it doesn’t sound very exciting, but try it. The big soft corn kernels and pieces of chicken go great with the nachos (called totopos) which are useful for the traditional art of scooping. A rustic and tasty pozole soup with condiments and totopos. Chiles en nogada is a seasonal food that originated in Puebla. It’s food with a history. The colors of chiles en nogada—the white walnut sauce, red pomegranate, and green parsley—correspond to the Mexican flag. And under that entire garnish is a poblano pepper stuffed with a mix of ground beef and pork, nuts, and fruit, including apple, pear, peach, and plantain (a banana for cooking). Like curry, mole is world renowned for being one complicated sauce. 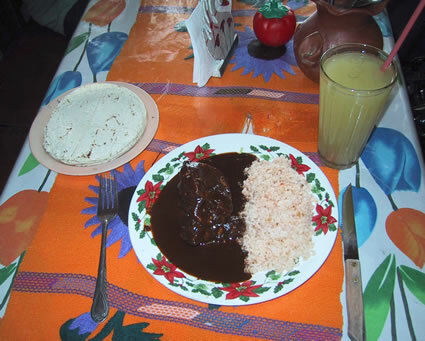 Mole can come in green, red, black, orange, even pink, and ingredients include chili peppers, crickets, or chocolate. It usually goes over chicken and rice. Black mole over chicken and rice. Mexico’s two long coastlines along the Gulf of Mexico, Caribbean Sea, and Pacific Ocean provide killer seafood. Look for seafood cocktails (coctel) with red sauce, onions, avocado, cilantro, and tomatoes. Eat them with crackers or nachos, and beer, of course. I also suggest that you try an order of camarones (shrimp), pulpo (octopus), ostiones (oysters), or pescado (fish) to get a full sense of the tastes. 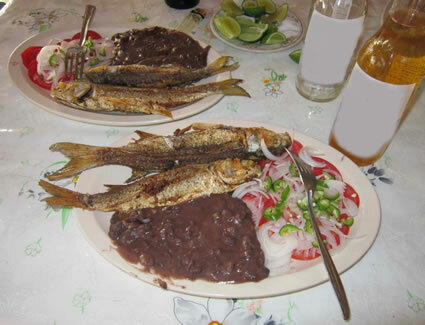 One of the many fish meals you may have in along Mexico's long shores. In this case, the location is Oaxaca. Ceviches are like seafood salads and often include shrimp, fish, octopus, or some other seafood. Unlike in Peru, the source of the original ceviche, Mexican ceviches usually contain cooked fish, rather than raw. You can also order a seafood salad (ensalada de mariscos), which will be similar but with more vegetables. An empanada can be stuffed with shrimp, fish, or almost anything else and then deep-fried. You can also get tostadas, big flat hard tortillas with lettuce, onion, avocado and the seafood on top. Fish is typically served whole with a small salad, rice, French fries, or nachos. Bring your Spanish dictionary to decipher all the options, such as frito (fried), empanizado (breaded), al mojo de ajo (with garlic) or a la diabla (spicy). However, if you don’t like the fish staring up at you as you eat it, you can always order a filete (filet). Finally, on the beach or in a restaurant, you should always be able to find pescadillas, which are quesadillas with fish (pescado). They should be cheap and ready to be doused in hot sauce. There’s a lot more seafood to eat in Mexico (look out for vuelve a la vida), but hopefully these suggestions are enough to get you started. Even tamales can be made with everything from chicken to shrimp to iguana. As a sweeping generalization, you will encounter three kinds of restaurants in parts of Mexico frequented by tourists. While on the tourist track or in big cities you will see burgers, pizza, Italian food, sushi—you name it. It may be good but will definitely be more expensive than real Mexican food. Beware of the Mexican food in these places. Mexicans tend to think that foreigners don’t like spicy food, so they dumb it down. If a tired basket of nachos sits on every table and the salsa tastes like marinara sauce, then you are in the wrong place. Many “Mexican” foods are not actually from Mexico. You won’t find burritos away from the U.S. border. Fajitas are called alambre. And nachos, like burritos, are an American invention—whether by an American or a chicano (Mexican-American), who knows. And unless you are at Señor Frogs or another tequila-shooter franchise restaurant, don’t order nachos. You will get 7-11-style pump-cheese garbage. It’s good to ask locals for advice, like at the front desk of your hotel, but explain that you want something real. Otherwise, you will be directed to a restaurant with the “Americanized” Mexican food they think foreigners like. The truth is—unfortunately in my view since it prevents tasting many of the very tasty traditional foods—that most people do like this stuff. It’s the Mexican food you get back home, but better. But it doesn’t come close to the real thing. Learn how to spot these places. 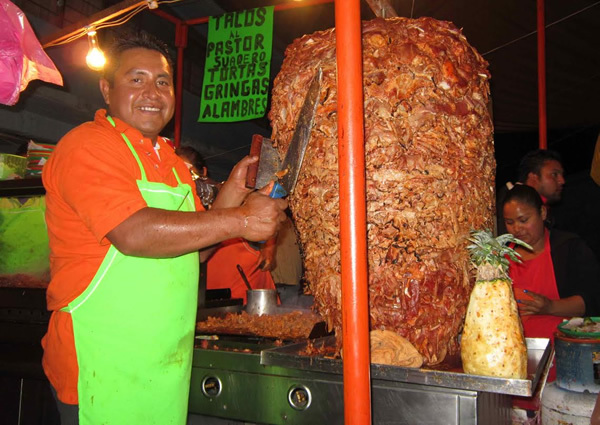 Most taquerias have a trompo (vertical spit) of pastor outside of the restaurants, although many nicer places won’t. Around 11 a.m., the fonditas begin to open. Look for big concrete rooms with an open kitchen on one side and a hand written menu of daily specials on the wall. For finer dining, any place that looks crowded with locals is a good bet. 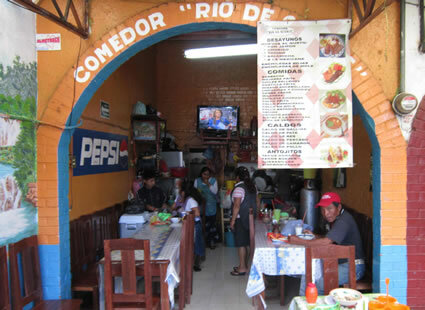 An authentic Mexican comedor (place to eat) with a set menu in front and the kitchen in the back. 1. Can you drink the water? While it’s true that you can’t drink tap water in Mexico (which is true in most parts of the world), don’t worry—99% of restaurants, bars, and clubs use bottled water for drinks and ice. The best way to prevent a food-borne illness is to avoid eating in an empty restaurant. If it’s empty, it’s empty for a reason. While every table in the U.S. has salt and pepper, Mexico has limes and salt. Squeeze the lime over tacos. Squeeze it into your soup. And squeeze it into the beer, but unlike north of the border, don’t stick it down the neck. Oh, and there are so many delicious tequilas in Mexico! Remember that if you buy tequila in a souvenir shop it will be wildly overpriced. Go to a supermarket. For higher-end but affordable tequila, I like 1800, Patrón, and Milagro. You won’t find a worm in your tequila. That would be mescal, and only certain brands, often not very good ones. Also, Mexicans love brandy, especially Torres. As for beer, Corona is everywhere, but if you prefer dark beer try Victoria, Indio, or Negra Modelo. If you are trying to save money, buy a caguama (40 oz.) at a convenience store. You pay a deposit for the bottle, so save the receipt. And finally, look out for pulque. I’ll say no more. Coming to Mexico and not drinking juice is a tragedy. You can get a huge liter of fresh orange juice or any concoction you like for between 10-30 pesos ($0.80 - 2.2 USD). Lighter than juice are aguas: look for jamaica (hibiscus leaves), horchata (sweetened rice drink) or tamarindo, among countless others. They are often sold on the street out of huge jugs, but every restaurant has them too. In restaurants and bars, tip 10% on food and drinks. Check your bill carefully to be sure it wasn’t already included. People usually don't tip at fonditas, but why not? Five pesos won’t break your budget. And always tip at the taco place, since the person may only be working for tips. Also, check your bill to make sure you weren’t overcharged. This is rare, but can happen, especially in touristy restaurants. Think of it as just one more reason not to eat in the touristy restaurants, and yet one more reason to seek out the authentic. 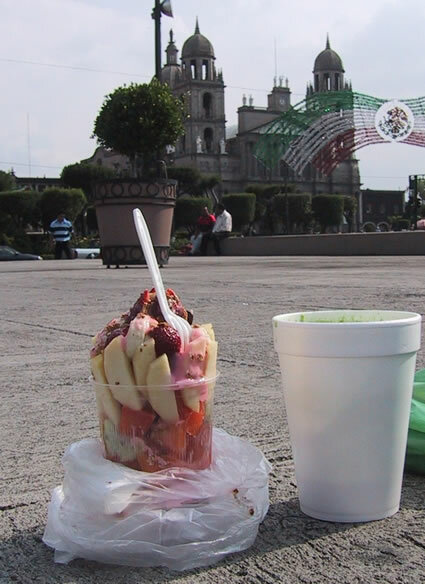 You can always relax and have a fruit cocktail and juice on a local town square after your meal or taco! Tacos al pastor Pastor tacos, seasoned pork. Good. Alambre Like fajitas, meat cooked with onions and peppers. Gringa A flour tortilla folded flat with cheese and meat. Enchiladas Rolled-up tortillas and more in green sauce. Chilaquiles Wet nachos in green sauce with cheese. Huarache A big, thick, flat tortilla. Pozole Masterful red soup, usually chicken. Mole A sauce of many ingredients; comes in red, green, black, etc. Chiles rellenos Stuffed bell peppers. Chiles en nogada Perhaps my favorite food in Mexico. Coctel de camarón Shrimp cocktail. Filete de pescado Filet of fish, can be prepared many ways.